Cash Converters International Limited (ASX:CCV) (&apos;Cash Converters&apos; or the &apos;Company&apos;) today announces the Company&apos;s unaudited financial results for the year ending 30 June 2017 (FY2017). Cash Converters International Limited (ASX:CCV) is pleased to announce further changes to its senior management team as the Company continues to progress through a period of strategic transition. Cash Converters International Ltd (ASX:CCV) (OTCMKTS:CKKIF) submit the report of the Company for the half-year ended 31 December 2016. Cash Converters International Ltd (ASX:CCV) (OTCMKTS:CKKIF) has delivered Revenue for the six months to 31 December 2016 of $143.5 million, and a Net Profit After Tax from continuing operations of $11.5 million, which while down 27.9% on the previous year is in line with expectations. Cash Converters International Ltd (ASX:CCV) (OTCMKTS:CKKIF) is pleased to advise that Ms Ellen Comerford and Ms Andrea Waters have been appointed to the board of directors with effect from 9 February 2017. Cash Converters International Ltd (ASX:CCV) (OTCMKTS:CKKIF) has taken a number of strategic actions over the past 12 months. Cash Converters International Ltd (ASX:CCV) (OTCMKTS:CKKIF) is pleased to provide the company&apos;s AGM Presentation held in November 2016. Cash Converters International Ltd (ASX:CCV) (LON:CCVU) (OTCMKTS:CKKIF) is pleased to provide the following trading and performance update based on the first quarter unaudited results for the 2017 financial year. Cash Converters International Ltd (ASX:CCV) (OTCMKTS:CKKIF) is pleased to provide its 2016 annual report to shareholders. Boardroom.media is pleased to announce a product and services partnership with ABN Newswire. 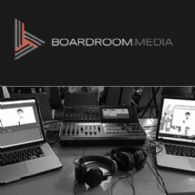 The agreement will see the media assets and programs including webcasts produced by Boardroom.Media distributed through ABN Newswire&apos;s network of professional platforms, finance portals, news aggregators and news outlets. Cash Converters International Ltd (ASX:CCV) (LSE:CCVU) (OTCMKTS:CKKIF) is pleased to provide the Company&apos;s Financial Report YE June 2016. Cash Converters International Ltd (ASX:CCV) (LON:CCVU) (OTCMKTS:CKKIF) are pleased to provide the Company&apos;s latest Investor Presentation regarding the full year results ending June 2016. Financial services company Cash Converters International Ltd (ASX:CCV) today reported a 10.2 per cent increase in underlying EBITDA profit to $69.1 million (FY 2015: $62.7 million) for the 12 months to 30 June 2016. Revenue was $379.3 million (FY 2015: $374.3 million). Cash Converters International Ltd (ASX:CCV) today announced a major change in strategy following a comprehensive review across all businesses. The company will focus on building on its brand and network strengths in Australia, and significantly reduce its operations in the United Kingdom. Cash Converters International Ltd&apos;s (ASX:CCV) Australian business continued to perform well in the six month period ended 31 December 2015 with normalised, underlying EBITDA up 11.0% to $38.3 million and we expect to see further growth in the remainder of FY 2016. Cash Converters International Limited (ASX:CCV) advises that the Company intends to release its half-year result for the period ending 31 December 2015 on Monday 29 February 2016. Cash Converters International Ltd (ASX:CCV) is pleased to announce that the Company has entered into a loan securitisation facility with the Fortress Investment Group (Fortress). This facility re-finances the existing banking facility on terms which are market competitive. Cash Converters International Ltd (ASX:CCV) are pleased to provide the Company&apos;s Annual General Meeting Presentation, November 2015. Cash Converters International Ltd (ASX:CCV) notes the Press Release issued on 24th September 2015 by Consumer Action Law Centre (CALC) concerning an action by a single borrower against Cash Converters. Cash Converters International Ltd (ASX:CCV) are pleased to announce the Company Financial Report for the period ended June 2015. The Company has a strong market position, a well-established store network, a rapidly growing online business and a product range that provides a solid platform to expand the business going forward. 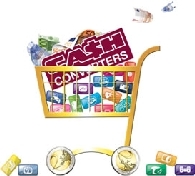 Cash Converters International Limited (ASX:CCV) (LON:CCVU) (OTCMKTS:CKKIF) advises that the Company intends to release its full-year result for the year ending 30 June 2015 on Friday 28 August 2015. Following the lodgement, the Company&apos;s Managing Director will host an earnings teleconference for investors and analysts. Cash Converters International Ltd (ASX:CCV) (LON:CCVU) (OTCMKTS:CKKIF) is pleased to provide the following trading and performance update based on the third quarter unaudited management accounts for the 2015 financial year. Cash Converters International Limited (ASX:CCV) would like to confirm that our interim dividend of two cents per share to be paid on the 31 March 2015, to those shareholders on the register at the close of business on 17 March, will be fully franked. Cash Converters International Ltd (ASX:CCV) is pleased to report a growth in revenue of 20.5% on the previous corresponding period to $187.7 million. 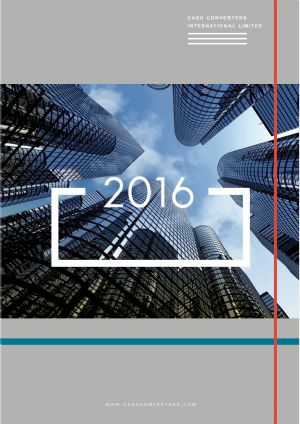 The normalised EBITDA profit for the period was $32.4 million, up 31.4% on the previous period. Cash Converters International Limited (ASX:CCV) is pleased to announce that it has finalised the acquisition of six franchised stores in Victoria. Cash Converters International Ltd (ASX:CCV) (OTCMKTS:CKKIF) report strong revenue growth, up 26.2% to $97.2m on previous corresponding period (pcp). Cash Converters International Limited (ASX:CCV) (OTCMKTS:CKKIF) is pleased to announce that it has entered into contracts, the principal effect of which is to terminate the agency agreements with development agents Kentsleigh Pty Ltd and Cliffview Pty Ltd.
Cash Converters International Ltd (ASX:CCV) is pleased to announce, that its wholly owned subsidiary, Green Light Auto Group ("GLA"), trading as &apos;Carboodle&apos;, has entered into an partnership agreement with FleetPartners for the provision of high quality fully maintained end of lease vehicles for re-lease to Carboodle&apos;s customers. 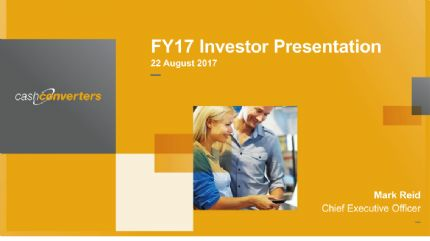 Cash Converters International Ltd (ASX:CCV) (OTCMKTS:CKKIF) Annual General Meeting MD&apos;s Presentation. 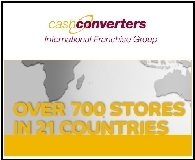 Cash Converters International Ltd (ASX:CCV) (OTCMKTS:CKKIF) advises that Mr David Carter will join the board of directors with effect from 1 December 2014. Cash Converters International Ltd (ASX:CCV) has recently completed the acquisition of the remaining 20% of the shares that it does not already own in the Green Light Auto Group Pty Ltd (GLA), trading as Carboodle, for cash consideration of $450,000. Cash Converters International Ltd (ASX:CCV) is pleased to provide the following trading and performance update based on the first quarter unaudited management accounts for the 2015 financial year. Cash Converters International Ltd (ASX:CCV) provide the Annual Report for 2014 with strong revenue growth up 21.6% to $331.7 Million. 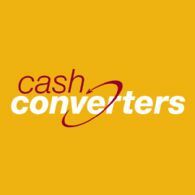 Cash Converters International Ltd (ASX:CCV) advises that Mr Stuart Grimshaw will join the board of directors with effect from 1 November 2014. Mr Grimshaw&apos;s appointment completes the director representative changes made by EZCORP Inc to the Board of the Company. The result generated earnings per share of 5.67 cents. The directors have declared a two cent per share final dividend. This brings the full year dividend to four cents fully franked. Cash Converters International Ltd (ASX:CCV) is pleased to announce that its subsidiary, Green Light Auto Group (GLA), trading as Carboodle, has entered into a Referral Agreement and a Broker Agreement with Australia&apos;s leading online car finance broker, Aussie Car Loans. Cash Converters International Limited (ASX:CCV) ("the Company") wishes to advise of a change to the Company Dividend Reinvestment Plan (DRP) in regard to the election date to participate in the DRP. The 2014 financial year for Cash Converters International Ltd (ASX:CCV) was marked by contrasting halves where we experienced a strongly improved second half following the transitory period that impacted the first half due to the implementation of the new micro credit regulatory requirements in Australia. Cash Converters International (ASX: CCV) - CommSec 2007 Emerging Companies Conference - Mr Peter Cumins, MD; Cash Converters International (ASX: CCV) present the following audio webcast regarding "CommSec 2007 Emerging Companies Conference". You may also download this audio webcast to your computer or portable audio player. Cash Converters International (ASX: CCV) - 2007 Full Year Results - Mr Peter Cumins, MD; Cash Converters International (ASX: CCV) present the following audio webcast regarding "2007 Full Year Results". You may also download this audio webcast to your computer or portable audio player.